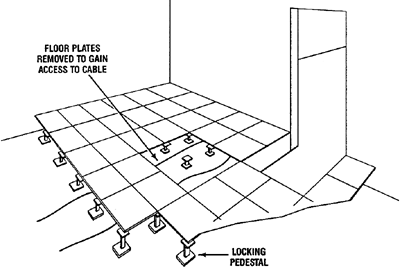 A floor fabricated entirely of square plates that rest on interlocked pedestals attached to the structural floor of a building. The plates usually are fabricated of aluminum and are covered with cork, carpet, or vinyl tiles. 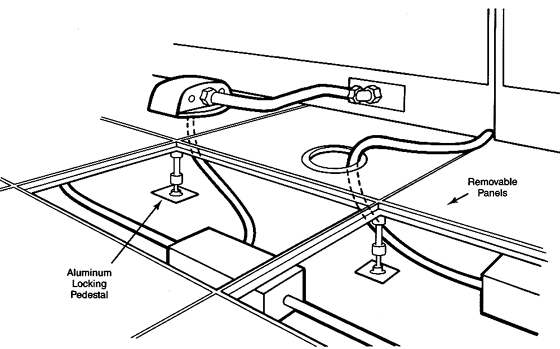 The plates can be removed to provide convenient access to the cables beneath; used extensively in computer rooms. Specifically, because the plaintiffs' home was post-FIRM and situated below the base flood-zone elevation, their SFIP did not cover all building and personal property losses "below the lowest elevated floor. It also features an interactive fountain with outdoor seating areas, a footpath, cycling track, sightseeing wings, and a three-metre elevated floor. The design for the 250sqm space for the UAE Pavilion, which will be within the ancient, centuries old walls of Venice's Arsenale, will include an elevated floor and vertical modules and special hanging systems, all of which will be installed in the coming days. The long bonnet, hatchback rear and elevated floor is a brain teaser because it looks so different to rivals such as the Volkswagen Tiguan, Nissan Qashqai and LandRover's Freelander 2. The sold-out exhibit hall included the popular RehabZone and the Damage Prevention & Safely Zone, a new area with an elevated floor constructed over "live" utilities to allow demonstrations and instruction on the use of utility locating equipment. Even now, the facility's only elevated floor remains closed, with Holmes offering no scheduled date for its opening. A low forked ridge (like a bird's foot, according to Elger) extends along the elevated floor much like a wrinkle ridge on mare surfaces. Limit the size and placement of building components found below the lowest elevated floor. The elevated floor is a series of silicate modular slabs, lighter than concrete and more sound absorbent. Tenders are invited for construction of the pile caps, grade beams on top of existing auger cast piles that were installed under a previous project, utilities, asphalt and concrete paving, curbs, sidewalks, fencing, landscaping, concrete columns, structural steel columns and framing, elevated floor slab, building envelope to include aluminum composite wall panels, modified bitumen roof and aluminum storefront/curtainwall, interior finishes, mechanical, electrical and fire protection systems.